The new Bobcat R-Series excavators are a good fit for builders. Positioned in the middle of the mini-excavator range, 2 to 4 tonne models can be the perfect size for the building contractor, with their ability to dig and lift what smaller units are unable to do and go where bigger machines cannot. Offering versatility as well as many attractive features as standard equipment, and combining these with transportability, manoeuvrability and fuel efficiency, these machines can really work well for many in the building market. These mid-size compact excavators offer high performance by incorporating features from machines in both smaller and larger size classes. Three of the features that have transferred from smaller excavators are the backfill blade, the centre pivot boom and zero tail swing design. Among the features that have moved down from larger excavators are high productivity features, such as tilt-rotators and hydraulic quick-attach systems, and enclosed cabs with heating and air conditioning. Electronics from larger machines have also moved to those in this mid-size class, bringing with them a host of benefits. In launching the company’s new R-Series mini-excavators from 2 to 4 tonne, Bobcat has taken this performance and innovation to unheralded levels. 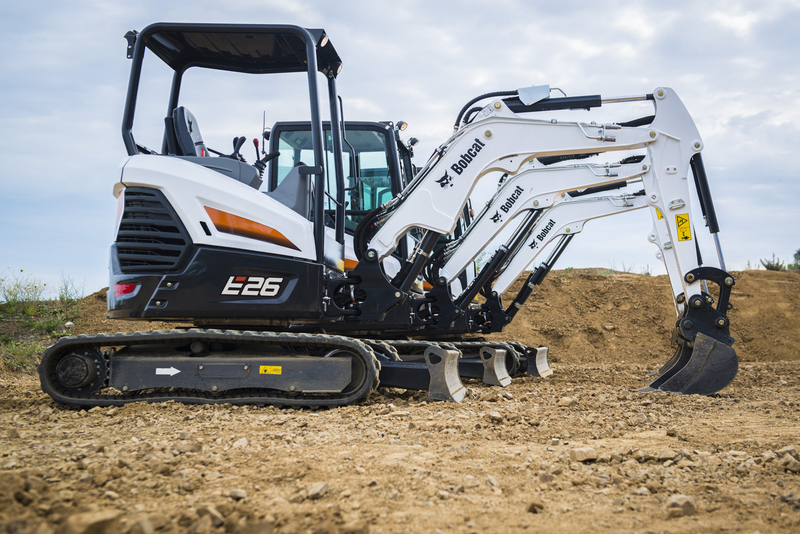 The new range of five compact excavator models – the E26, E27z, E27, E34 and E35z – offers a mix of high digging forces, stability and smooth controllability of working functions complemented by low weights for easy transportation. The R-Series excavators utilise newly developed flexible machine platforms that allow different configurations of models and specifications to suit a wide range of applications and customer needs. In addition, while taking engineering and productivity to new heights, the development team has ensured they offer greatly enhanced operator comfort and functionality and the best fit for key applications. The units now feature a larger operator space and improved entry/exit, thanks to new ergonomic 3D handles and a wider door. The new cab also features significantly larger windows and narrower pillars improving all-around visibility. Inside the low noise-low vibration cab, the operator has the benefit of new joysticks and new optimised metal travel pedals. The new minimal effort joysticks offer further enhanced controllability and smoothness of working functions. For working with attachments, such as tilt-rotators, the operator also benefits from up to five independent auxiliary hydraulic circuits and a new optional ‘Selectable Auxiliary Control’ (SAC) system for customisable joystick controls. The SAC enables the operator to select/switch the control pattern for the auxiliary lines, which allows them to work with the most advanced attachments in the most convenient way. The excavators can also be equipped with a deluxe control panel display offering extra information for increased troubleshooting and additional functionality of the new selectable auxiliary control system (SAC). While keeping proven, easy to maintain mechanical injection engines, all R-Series models meet the upcoming European Stage V engine emission regulations. The new generation of the popular E26 is an easy-to-use, robust machine optimised for demanding owner-operators such as those in the building industry. The new E26 excavator has a transport weight reduced by 100kg but increased over-the-side lifting capacity, with a maximum digging depth of 2,568mm and a maximum dump height of 2,845mm. The new 2.7 tonne E27z model further enhances the performance characteristics of Bobcat’s previous E26 machine, with the largest cab for this size of machine on the market. As a true Zero House Swing (ZHS) machine (even with the optional heavy counterweight), the unit offers the highest flexibility of movements when working close to walls, coupled with 360-degree stability and a low weight for easy transportation. With the optional long arm providing a maximum digging depth of 2,847 mm and a premium cab, the E27z offers the digging output and operator comfort of much larger excavators, making it a machine of choice for contractors and building companies. Also offering a maximum digging depth of 2,847 mm, the new conventional swing E27 model also benefits from just 280mm of tail overhang, which allows the machine to be operated in confined spaces. This makes the machine an ideal tool for highly demanding applications where performance together with transportability have a priority over compactness. Moving to the E34, this is a new generation 3.4 tonne conventional model with a maximum digging depth of 2,417mm in the long arm version and further enhanced controllability. It features a new roomy premium cab with optional air conditioning to ensure an ideal operator environment in all weather conditions. When transportability on a trailer and zero house swing are not needed, this machine offers a great mix of performance, stability and operator comfort. The E34 and E35z are also the only machines in their class which are available with the optional automatic (hydraulic) track tensioning feature, which further minimises the need for maintenance and the risk of de-tracking. The new blade design used in the R-Series offers more robustness and enhanced self-cleaning ability. The redesigned boom cylinder guard is complemented by increased protection of hoses, pipes and valves on the workgroup. Bobcat is the only manufacturer offering two alternatives for positioning auxiliary couplers – boom-mounted for optimal protection or arm-mounted for easy access. To easily and safely connect attachments, Bobcat offers multiple mechanical or hydraulic coupler systems. Lehnhoff type couplers are now available with factory installed tilting adapters (controlled by a dedicated AUX4 circuit). A bucket diverter valve kit (AUX3) is also available to operate a clam shell bucket attachment. Other options include LED lights and an easy to install beacon. For safer transport, four additional tie down points have been added on the upper structure. As before, the new R-Series excavators offer the easy access that Bobcat is well known for, for regular maintenance and servicing. Exterior covers have been designed to be easy to open and close.